May 2016 – For the second year in a row, I was a finalist for the Art and Olfaction Awards, the Sadakichi Award for the Experimental Use of Scent. This time it was for "SIGNAL", a multi-dimensional proposed message to be encoded for interstellar transmission. 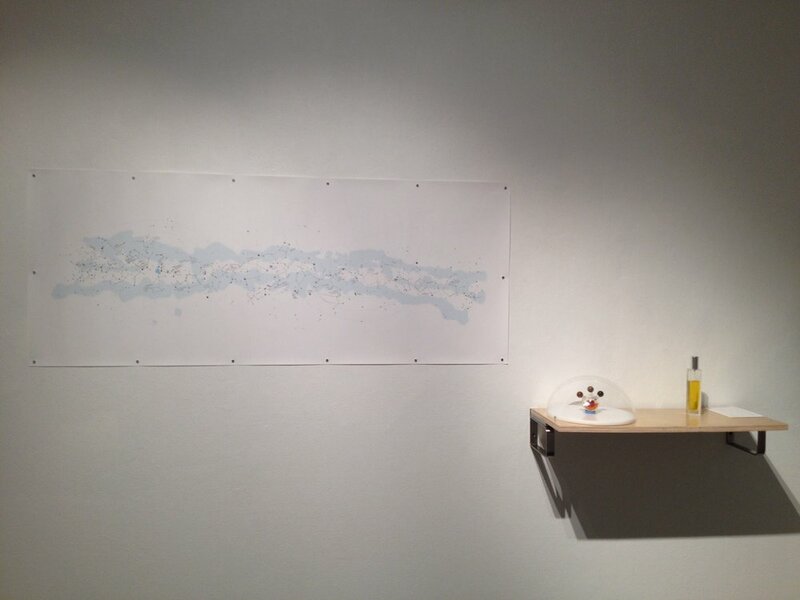 The scent and accompanying artworks were shown at Cerritos College in Fall 2015 for "Abstracted Visions and Data Visualizations" curated by James MacDevitt. A hyperbolic description of the scent can be found here. September 2016 – now available: Heavenly Discourses, the proceedings of a conference held in Bristol, UK in 2011 about "Myth, Astronomy and Culture". My contribution is pp. 151–170, "Interstellar Messaging: An Embodied Perspective". Included are eleven images, some of my artwork, and the proposition to send a signal that would be "a sensual reflection of human culture. It would use complex chemical signatures of molecules that have a specifically recognizable scent and are meaningful to humans and other living creatures, so as to better convey the cultures and environmental microcosms that make up Earth and upon which we rely." Along with renewed enthusiasm for messaging and exoplanets, we are also in a dark moment, where aging SETI scientists convinced we will find a signal in their remaining lifetimes ask, What if we perish? "Who" will know we existed? The view that there must be other beings who would see the best in us is nothing other than a quasi-religious view of the universe, yet by many scientists this suggestion of spirituality is roundly denied. An existential crisis is nevertheless fertile ground for artwork and non-verbal expression, testing our limits to conceive of our own mutual destruction. November 2015 - Now online! "Space-Time Transits and Fictions" was a session in which I was invited to participate during a conference held at The New School in November 13-14, 2014. The conference was held by Project Anywhere and explored the challenge of producing and disseminating art and research outside traditional circuits. This is my presentation, followed by a Q+A for panelists. Click here to see the whole session. To see sessions from the whole conference, click here. UPDATE November 2016: Just received the book of proceedings. From the Foreword by Anne Gaines, Dean of Parsons, the book is an invitation to examine, "through this biennial celebration of art at the outermost limits of location-specificity, ... the complexities of society, encounter new boundaries and find an investment in the future of art research and practice." A series of perfumes I created with Karen Reitzel for Charles Long and his epic installation CATALIN at the Contemporary Austin Art Museum was recognized at the 2014 Art and Olfaction Awards in the "experimental" category. Basenotes covered some of the highlights of the awards evening (great photos), and The New Yorker gave a little more detail about our competition for the Sadakichi Award for Experimental Scent. Our team is on the left in the photo taken by Steven Rimlinger. Karen Reitzel, Seth Hawkins standing behind Charles Long and I, with all the other finalists and winners. What a fun night. I participated in the SETI's internal workshop "Communicating Across the Cosmos" at the SETI Institute in Mountain View, California on November 10-11, 2014. Afterward, I was interviewed about my proposal in the KQED Science report produced by Amy Standen, and for an article on BBC Future by Tracey Logan Are We Sending Aliens the Right Messages?. "Making Scents of Life on Earth: Embedding Olfactory Information into Multi-Channel Interstellar Messages"
Carrie Paterson's talk proposes that an important goal for Active SETI will be to communicate the diversity and complexity of life and human cultures on Earth. She argues this will best be achieved by exploring ways to embed decodable but elaborate chemical information in signals that point to the lived experiences (e.g., embodiment) of being creatures not only living on this planet, but who are intimately of Earth. Could this be an Earth-collaborative artwork? The lecture suggests some possible technological solutions for sending multi-channel SETI signals using multi-spectrum lasers as opposed to a stream of linear, binary information, and suggests who might be involved in creating it by taking lessons from art in the public realm. The talk's starting point connects our evolutionary inheritance as a species—the limbic/olfactory system, which is the most ancient, reptilian part of our brains—to a proposal for SETI signals designed not just to communicate our intelligence, but also our deep connection with other living beings, both plant and animal. 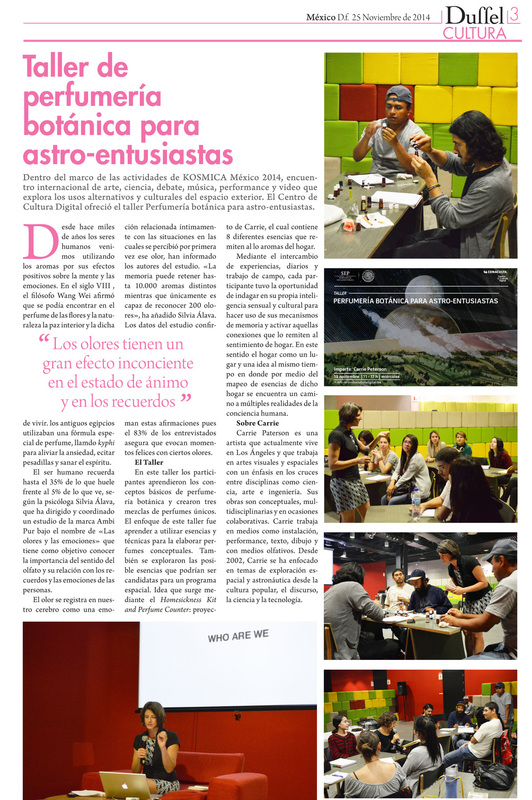 In Mexico City on November 18, 2014 I gave a perfume workshop for astro-enthusiasts during KOSMICA, a week-long art and science festival put on by the Arts Catalyst (some interviews about KOSMICA available here). As part of the events, I also lectured about my project The Homesickness Kit at the Laboratorio Arte Alamenda. The workshop took place at the Centro de Cultura Digital, and one of the participants, Julien Cruz (pictured in the center of the last block of thumbnails), wrote the article below and took the accompanying photographs. Participants came from many disciplines including art, journalism, physics, writing, and landscape architecture. More photos courtesy Julien Crus, below. Participants, click here for my iphone pics of you!